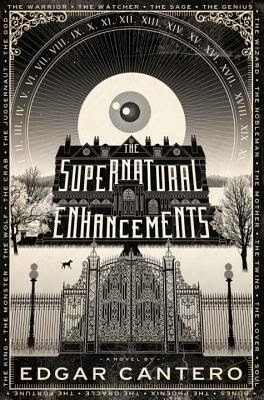 The second I saw Edgar Cantero's The Supernatural Enhancements, I knew I had to read it. I managed to avoid all mention of what it was about (because who needs any more impetus than that cover, right?!) and only took in the praises of various readers that I respect. I put in my hold at the library and thankfully it came in quite quickly (I can only assume because everyone who picks it up speeds through it without being able to put it down). I'm going to be a bit secretive about the plot because, as I was tweeting with Becca about it (she was reading it at the same time), I realized "I like the way it reveals things slowly, after you've already assumed something else". I think this is definitely part of the genius of Cantero's writing. The story is told through letters, journal entries, and audio and video recordings. It incorporates literature, puzzles and cyphers, and nameless things that are only to be found in dreams and nightmares. The two main characters, A. and Niamh, are young and slightly mysterious and likable. And Axton House with its supernatural enhancements is a place of history and mystery. I've already got Chris reading this book (and the last time I talked to him about it he was loving it). Have I convinced you to pick it up? Letters and diaries and twists and that cover are all powerful arguments :P Sounds perfectly October-ish. I need to read this one! I'm going to see if my library has it. I think it's still relatively unknown so hopefully you have little to no wait! Can you believe I'm still only about 100 pages into this? It has NOTHING to do with the book and everything to do with the state of my life lately. So in love with the book though! Hoping to knock out a big chunk tonight! Stupid life. ;) You just need to get going again and you'll get whisked away. Everything you've said makes this a must read for me. Very tantalizing review! 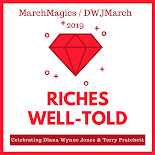 Sounds sort of like Cuckoo Song, by Frances Hardinge, which also isn't what you expect it to be and keeps revealing more and more of itself until you are completely wrapped up in it. Also a good Octobery book. I haven't read the Hardinge book but it sounds intriguing too. I'll have to go look it up! Hahaha, okay, yes, you have convinced me! I cannot for love or money resist the siren call of an epistolary novel, and the cover was already drawing me in even before I knew it was epistolary. I shall get it at the library straightaway! You are now the third person I've seen who has loved this one - I think I need to get it ASAP.